Bryan Wild’s view of the RAF was typical of thousands of its members during the war – he knew it as an extended family of those who served, engaged in dangerous but highly exciting action in the air, offering new and wonderful experiences, great friendships and the chance to fly the most up-to-date aircraft of the day over both familiar and new territories. 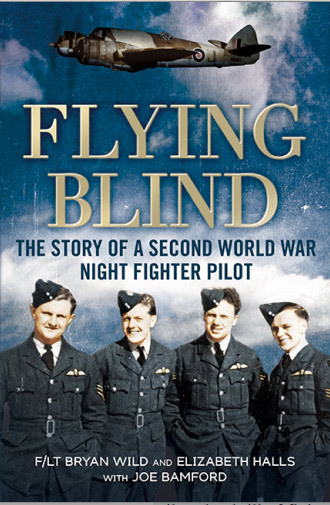 Bryan Wild said of the war that he had the time of his life, and that is what ‘Flying Blind: The Story of a Second World War Night Fighter Pilot’ is all about. Bryan Wild ended the war in 1946 as a Flight Lieutenant. He was not a famous war hero and did not win any decorations. He saw his wartime experiences as typical of his type, frustratingly so, as he was always eager to get some action, and this was not always as forthcoming as he would have wished. When it did come, like others he found it terrifying and tragic in its consequences, but again, this was the common lot for those days, in the RAF, the Royal Navy and in the Army. Bryan Wild speaks for many in this memoir, and gives a taste of life in the RAF: the best of days, and the worst of days – and the making of him. This website is sister website to Where They Served – Elizabeth Halls’ follow-on tour of the 60 airfields in mainland UK where her father landed during the war, driving a 1935 Singer Le Mans sports car similar to her father’s wartime car, and raising money for the RAF Benevolent Fund.